I was so happy and lucky to win a contest on Instagram–I enter a lot giveaways, so to actually win something was such a thrill! 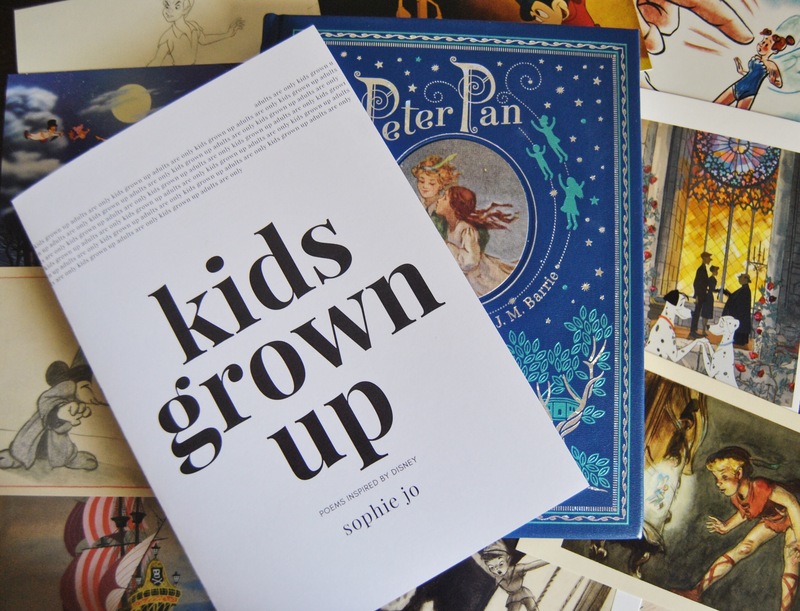 But this wasn’t just any old contest–the prize was a copy of Sophie Jo’s (@sophiejowrites on Twitter and Instagram) Disney-inspired poetry book, kids grown up. POETRY. INSPIRED BY MY FAVORITE THING EVER. DISNEY. This literature-loving girl’s heart was SO happy to win an item I’ve been eyeing for months. First of all, the aesthetic of the book is so simple and clean, and I can’t wait to get more furniture so I can get a little stand for it and display it forever. I have a small collection of Disney books, and this is the perfect addition to my menagerie of magic. There’s so much more to this poem, but I should stop quoting. Go. Purchase this book to read this poem; I love it so much. Whenever I get “homesick,” this will be my go-to. THAT LAST BIT…ISN’T THAT BEAUTIFUL?! I hope I pour my “childlike self” into each and every day. To Sophie Jo: thank you for selecting me as one of the winners of your contest. I am over the moon about your precious book–it will act as a source of inspiration for me as I make my way through graduate school and work on achieving my own writing goals. To my readers: CHECK THIS GIRL OUT! I hope she publishes more in the future, because I just love the language she uses to describe my favorite thing in the world. As always, have a magical day, and please pour your own childlike self into every second of it. That’s an order.